The Blackwell Guide to Ancient Philosophy provides a comprehensive treatment of the principal figures and movements of philosophy from its origins before Socrates, through the towering achievements of Plato and Aristotle, and into its final developments in late antiquity. 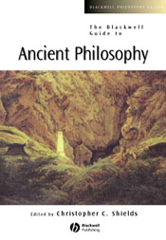 Provides a comprehensive guide to ancient philosophy from the pre-Socratics to late antiquity. Written by a cast of distinguished philosophers. Covers the pre-Socratics, the sophistic movement, Epicureanism, academic skepticism, stoicism, and the neo-Platonists.